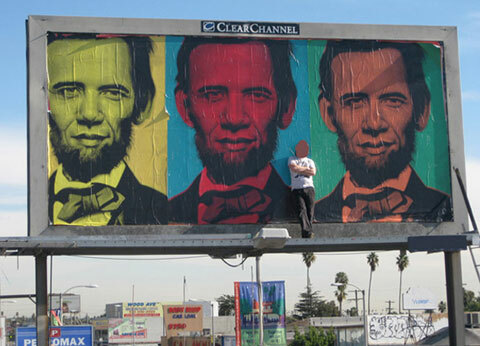 Ron English, the man behind the now iconic (although not quite as iconic as Shepard’s Obama Hope image) Abraham Obama image welcomed our new President to office in a unique (and eye-catching) manner: he and his crew of ad-busting minions took over a Clear Channel billboard in Los Angeles. So typical of Ron; always needing to be the biggest and best, huh? 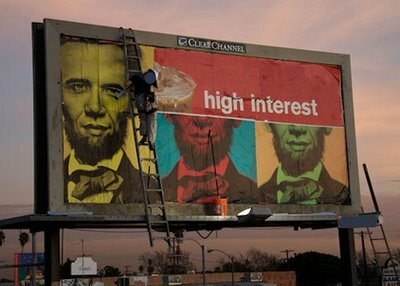 Well, we love it and suggest you sneak a glance if you’re in sunny SoCal, or peep his latest gallery work, which is now on display through January at FIFTY24SF Gallery.